"The 5 books of Moses are a treasure. 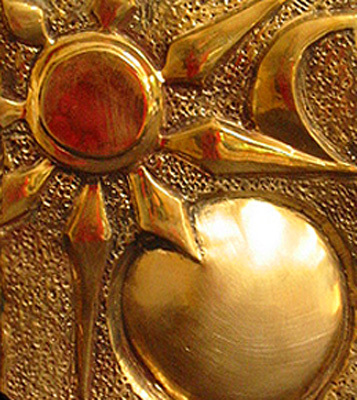 This image, Breishit, is a detail of Treasure Chest, a metall box about 6" tall. With relief sculptures of each of the 5 books cast in bronze, this box is a treasure chest, it speaks of the treasure of Torah." On the holiday, Breishit, or Genesis, is read from the second scroll. More info on the holiday of Simchat Torah here.